Massachusetts's Central and Berkshire Mountains regions have lofty peaks and gorgeous river valleys that are ideal for seeing the leaves change color during fall foliage season. Great views of fall color – starring the sugar maple -- also are found in the North of Boston Cape Ann region, and around Plymouth, where cranberry bog harvests brighten the landscape. 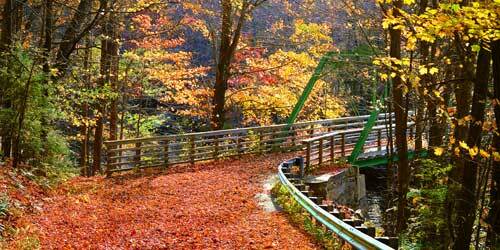 Choose a scenic foliage drive below. 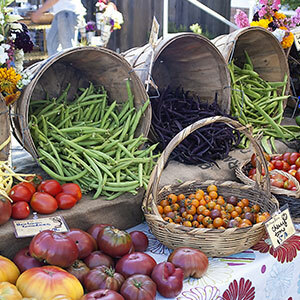 Watch for farm stands and pick-your-own farms! Click here for useful information about when to visit, how to find color, and what to wear and pack. 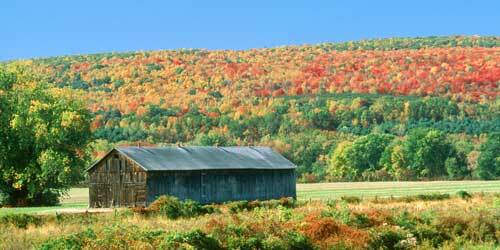 In the Berkshires region, a great resource for foliage viewing is The Leaf Chief. Find directions and tips for great views and attractions for at the drive tours described below. Route 2, also called the Mohawk Trail, is a historic road that travels through the northern Berkshire Mountains. This Route describes a tour from Greenfield in the east to North Adams in the west, with a side trip to the summit of magnificent Mount Greylock at Mount Greylock State Reservation. In Greenfield, take a pleasant walk and wear out your kids at Rocky Mountain Park on the Connecticut River. 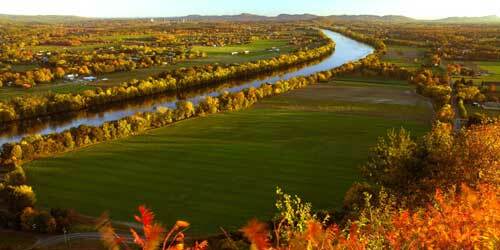 This forested ridge stretches along the river and has hiking and biking trails and the popular Poet’s Seat Tower. Nice for walking, bird-watching, and peaceful contemplation. Shelburne Falls, a bit west of Greenfield on Route 2, is a pretty town on the Shelburne River. Right in its center is the famous Bridge of Flowers, a former trolley bridge that is planted with 500 varieties of flowers, vines, and shrubs (open April 1 to October 30). Stroll to the Salmon Falls Gallery, then watch the river racing over a mesmerizing series of falls. Continue through Mohawk State Forest. Before you get to the next major town, North Adams, you will navigate a crazy, nearly 360-degree hairpin turn. With advance planning, you can schedule a zip line tour at Zoar Outdoor or Berkshire East, both in Charlemont, very close to Route 2. North Adams is full of culture and shopping and interesting sights. Consider stopping into MassMoCA (the Massachusetts Museum of Contemporary Art). MASS MoCA exhibits work by many of the most important artists of today; it hosts dozens of performances year-round. At the Natural Bridge State Park in North Adams, you will be stunning by nature’s artistic beauty when you see a naturally formed white marble arch and man-made white marble dam. Side Trips: Before leaving or after arriving in North Adams, swing southward for a drive to the stunning summit of Mount Greylock. The trip to the top of Mount Greylock in the Berkshires is a magnificent adventure. October foliage colors are glorious. The summit is 3,491 feet and it yields views of the Green Mountains of Vermont and the Taconic Range. At the top is Bascom Lodge, offering meals and overnight accommodations. Also at the top is an elegant tower dating from 1932 and honoring the state’s fallen soldiers. Access road closes November 1. The map above gives directions from North Adams to the north (10 miles to the summit) and from the town of Lee, on route 90 to the south (27 miles to the summit). Brake for Farm Stand! – If you are headed up Mount Greylock from the south, make a stop at Lakeview Orchard at 94 Old Cheshire Road in Lanesborough. Enjoy the panoramic views of Hoosac Lake and stock up for your adventure with apples, apricots, plums, and homemade pierogi, golumpki, ravioli, and gnocchi. (413-448-6009). The Connecticut River starts at a pond near the New Hampshire / Canada border and swells to a 410-mile north-south waterway, bisecting the region until it empties in Long Island Sound near Essex, CT. The Massachusetts part of the Connecticut River National Byway cuts through the center of the state, from Northfield at the northern end to South Hadley at the southern end, mostly along routes 63 and 47. Distance between Northfield and South Hadley is 37 miles. South Hadley is home to Brunelle's Marina on the Connecticut River. You might suspend your road trip for a short river cruise on the Lady Bea, docked at Brunelle’s. The 75-minute cruise meanders up the Connecticut River to Northampton. Cruises run from Memorial Day to Columbus Day. Mount Holyoke College Botanic Garden encompasses the Mount Holyoke College campus, including an arboretum and numerous gardens, as well as the Talcott Greenhouse. Open daily, sunrise to sunset. 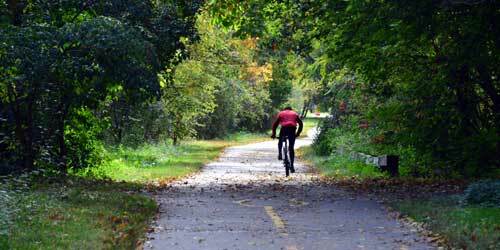 Skinner State Park, between South Hadley and Hadley, offers access points to the New England National Scenic Trail. At the peak of Mount Holyoke in Skinner Park, you can explore The Summit House, a 19th-century hotel. The Montague Mill is located just a few blocks from Montague Center, at 440 Greenfield Road. It is a former stone grist mill that now is home to the Lady Killagrew Cafe, the Montague Bookmill (“Books you don’t need in a place you can’t find”), Turn It Up! music and movies, artist galleries, and antique stores. It overlooks the Sawmill River and a former dam. Moving along routes 63 and 47, you are traveling through the bread basket of Massachusetts. Many farms that date back more than 100 years. You can indulge your sweet tooth when you reach the Northfield Creamie in Northfield, the northern terminus of this drive. This drive threads between Northampton and Amherst, where several easting places opened or expanded in 2017. Falafel fix at Pita Pockets and gourmet doughnuts at Glazed are now available in both towns. The Northampton Nourish Juice Bar opened the full-service Nourish Wellness Café, serving juices and smoothies and a signature Wellness Bowls. Foreign food choices in Amherst also now include Lebanese cuisine at Malek Shawarma and food of Nepal, India, and Bhutan at Himalayan Friends Corner. Brake for Farm Stand! North Hadley Sugar Shack at 228 River Drive in Hadley is a fun place to browse and stock up on maple products, honey, pancake mix, jams. Open daily. For kid travelers, the Farm Tale is a farm animal play park, May to October, where families can learn about farm animals and enjoy all of the kid friendly play equipment. 413-585-8820. Route 2 is a beauty, passing through small towns and glorious views. 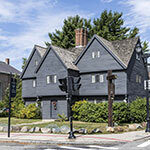 This route includes stops at two fascinating villages where New England history is lived and demonstrated. Fruitlands Museum in Harvard, one terminus of this foliage drive, takes its name from am 1843 utopian community led by Bronson Alcott (father to writer Louisa May Alcott) on this land. Today, visitors can explore a historic farmhouse, a Shaker Museum, galleries of Native American art and paintings of the Hudson River School, and lots of walking trails. Continuing west on Route 2, in Phillipston, plan a stop to stretch your legs and buy some treats at Red Apple Farm at 455 Highland Avenue (978-249-6763). 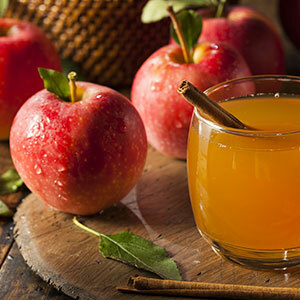 Brace yourself for apples and cider, cider donuts and kettle corn, and cheeses. If you want to plan a sit-down meal, Johnson’s Farm at 210 Wheeler Avenue in Orange, just a bit farther west on Route 2, serves meals and offers a neat gift shop. Homemade breads and maple syrup to take home, too! A wonderful experience awaits you at Northfield Mountain Recreational and Environmental Center at 99 Millers Falls Road in Northfield (800-859-2960). Located along a beautiful sweep of mountainside, with facilities along the Connecticut River, this recreational center has 26 miles of trails, canoeing or kayaking at Barton Cove, and a guided riverboat cruises. Also, rock climbing at Rose Ledge for foliage views. At the western end of this drive, plan to take a swing to the southwest to visit Historic Deerfield in Deerfield (413-775-7214). The real 330-year old village is a museum of 12 houses dating to the 18th and 19th centuries and three exhibition galleries at the Flynt Center of Early New England Life. Tours, seasonal events, classes, and village walks reveal the inner daily lives to our ancestors, There a museum story and bookstore, and a place to get a good, filling meal at Champney’s Restaurant & Tavern at the Deerfield Inn. 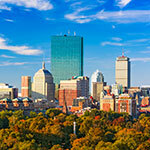 This drive tour will take you past or through some of the prettiest coastal towns of New England. 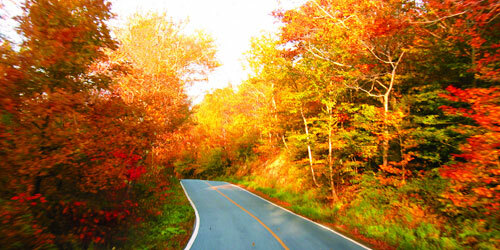 You will see beautiful foliage and other autumnal sights, like pumpkin patches and corn mazes. The drive comprises two sections that you can combine any way you like. One section is centered on the town of Newburyport, midway between Salisbury Beach and Plum Island (details below). Great trip for people who love walking beaches and watching marine plant and animal life. The other drive begins (or ends) at a historic house, Castle Hill on the Crane Estate with a breathtaking vista above a large estuary, and then meanders through the towns of Essex, Gloucester, and Rockport. This last town, in particular, is noted for its many galleries and gift shopping, and views of the iconic Motif #1 lobster shack, painted and photographed by generations of artists. Newburyport is a fun town for dining, shopping, browsing art galleries, and strolling. A brick plaza – in contrast to the traditional New England green – is the heart of the town, and lots of public events happen here. If you visit in the fall, you might easily stumble upon an Oktoberfest or a family fall festival. Salisbury Beach State Reservation is a long, beautiful beach, anchoring at the north end by a slightly honky-tonk-ish commercial area where you can get ice cream and classic summer foods like fried dough, and let kids bliss out for a little while at the arcade. Plum Island is an 11-mile long barrier island a short drive from Newburyport. 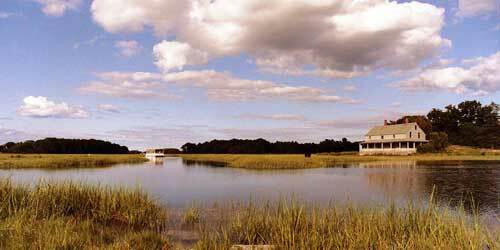 On your way out to the island, you will pass the Audubon Society's Joppa Flats Educational Center. Stop in for information about the seaside life you will encounter as you stroll the barrier beach. Inquire about bird watching tours, for today or another visit. Castle Hill on the Crane Estate in Ipswich. This historic home is a joy to visit. Start, if you wish, with a tour of the Stuart-style mansion (offered seasonally) and then enjoy the gardens, the spectacular Grand Allee – a wide, terraced, grassy path from the mansion to the beach, framed by marvelous statues – and the views from the whole property of the seashore and a giant estuary and marsh meadow below. Essex Shipbuilding Museum in Essex is a wonderful way to become immersed in the ancient ship-building culture of Massachusetts. Small museum with neat tools, boat parts, sea charts. Kids love it! 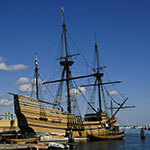 Gloucester is a historic fishing port, made famous by the movie "The Perfect Storm." Take a look at the Gloucester Fishermen's Memorial on Western Avenue. The Annisquam Lighthouse on Wigwam Point River is a beauty. Dogtown is an unusual walking park north of town, off Route 27. It is a wild area filled with mysterious mottos carved into boulders, mementos of a vanished community. 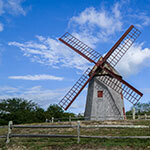 Rockport is famous for its many great galleries. Walk out onto Bearskin Neck for souvenir shopping and look at Motif No. 1, the often-photographed fishing shack, and Straitsmouth Island Lighthouse. Dock Square and Main Street are chock full of shopping and artwork. Brake for Farm Stand! – If you go to Ipswich, be sure to stop at Russell Orchards, 143 Argilla Road in Ipswich. It’s a lush farm stand – actually, a beautiful barn -- with food, wines, plants, books, food and farm gifts, pick-your-own crops in season, and animals to visit. (978-356-5366). This drive, starting in the town of Lexington, is only six miles, but it takes you through beautiful scenery and also the flash points of the early years of the American Revolution. History buffs may want to park in Lexington and take a narrated bus tour with Liberty Ride. The tour passes sites like the Lexington Battle Green, North Bridge, Battle Road, Orchard House, Colonial Inn, the Old Manse, Concord Museum, and Emerson House. (Tours offered through October 25). 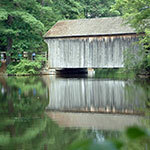 From Lexington, drive to the Minute Man National Historical Park at 250 North Great Road (Route 2A) in Lincoln, and explore this fine park. Next, get on Route 2A and then switch to Lexington Road, into Concord. This pretty town will charm you with its Colonial flavor. Stop for a meal at Concord's Colonial Inn, built in 1716 and Listed on the National Register of Historic Places. The inn is surrounded by landmarks of literary and revolutionary history. 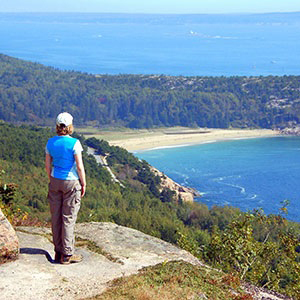 Find more Scenic Drive Tours in Massachusetts.